Freedom, WI - May 18, 2017 - Promoters of the DiscountShopTowels.com Dirt Kings Tour are excited to announce that Wehrs Machine will support the tour in 2017. Wehrs Machine will provide a $50 product certificate to be awarded at each DiscountShopTowels.com Dirt Kings Tour event this season. The certificate will be awarded to the winner of the feature, unless that driver has already won. In case of a repeat winner, the Wehrs certificate will be awarded to the next highest finisher, as each driver can only win this certificate once during the 2017 season. To learn more about DiscountShopTowels.com Dirt Kings Tour, be sure to follow the Dirt Kings Tour on Facebook (/dirtkingstour), on Twitter (@DirtKingsTour) and on Instagram (DirtKingsTour). Freedom, WI - May 17, 2017 - Promoters of the DiscountShopTowels.com Dirt Kings Tour are excited to announce that Quarter Master will provide a product certificate good towards any of their products at every DiscountShopTowels.com Dirt Kings Tour event this season. The Quartermaster $50 certificate will be awarded to the driver who finishes 10th or higher in the feature event, as each driver can only win this certificate once during the 2017 season. Quarter Master is part of the Comp Performance Group and produces clutches and driveline components for severe duty applications like dirt late model racing. Quarter Master also produces Ultra-Duty starts and performance bell housings that are widely trusted for their quality fit and resilient quality. Freedom, WI - May 4, 2017 - Promoters of the DiscountShopTowels.com Dirt Kings Tour are proud to introduce Kirkpatrick Law Office, LLC as the official legal counsel and sponsor of the DiscountShopTowels.com Dirt Kings Tour. Kirkpatrick Law Office of Eau Claire, WI has a mobile statewide practice involving criminal and OWI defense, personal injury, local counsel representation, collections, and traditional main street legal consultation. The DiscountShopTowels.com Dirt Kings Tour is excited to rely on the dependable knowledge Kirkpatrick Law Office can provide. Kirkpatrick Law Office will provide prize money to be paid out in the Championship Point Fund. Attorney Kirkpatrick is a lifelong racing fan from Freedom. Growing up, his summers involved attending the dirt tracks in Seymour and Shawano. His summers still include those tracks when he is in the area as well as Red Cedar in Menomonie and Rice Lake Speedway. He is looking forward to experiencing the tracks of the DiscountShopTowels.com Dirt Kings Tour. We are just ONE MONTH AWAY from the first race of the DiscountShopTowels.com Dirt Kings Late Model Tour 2017 Season at Oshkosh SpeedZone! Freedom, WI - April 6, 2017 - Promoters of the Dirt Kings Late Model Tour are excited to announce a multi-year partnership with DiscountShopTowels.com. DiscountShopTowels.com will become the title sponsor of the series that will now be known as the DiscountShopTowels.com Dirt Kings Late Model Tour. DiscountShopTowels.com is a Wisconsin based e-commerce company specializing in high quality disposable wipers and supplies for the racing, industrial, and dairy industries. DiscountShopTowels.com distributes a wide variety of shop products nationwide on both a small and large scale. DiscountShopTowels.com combines firsthand experience and personalized customer service to provide the best value. With sponsorship from DiscountShopTowels.com, the 2017 points fund and contingency sponsorships now total in excess of $20,000. More information about the DiscountShopTowels.com Dirt Kings Tour is available at www.dirtkingstour.com. To learn more about the DiscountShopTowels.com Dirt Kings Tour, be sure to follow the DiscountShopTowels.com Dirt Kings Tour on Facebook (/dirtkingstour), on Twitter (@DirtKingsTour) and on Instagram (DirtKingsTour). To learn more about Dirt Kings Tour, be sure to follow the Dirt Kings Tour on Facebook (/dirtkingstour), on Twitter (@DirtKingsTour) and on Instagram (DirtKingsTour). Freedom, WI - March 27, 2017 - Series Officials from the Dirt Kings Tour are excited to announce Allstar Performance will present a $100 Hard Charger Award to the Dirt Kings Tour Driver who passes the most cars during each feature event during 2017. Additionally, Allstar Performance will award three certificates of $250, $150 and $100 respectively to the top three hard charger points earners throughout the entire 2017 Dirt Kings Tour. Allstar Performance will also bestow a coveted Allstar Performance Hard Charger jacket to the top overall Hard Charger points earner. Allstar Performance is an industry leading parts supplier to teams and parts dealers across the country. Allstar Performance offers racers access to thousands of parts and performance components. Visit www.allstarperformance to get an Allstar Performance catalog or find an Allstar Performance dealer near you. Freedom, WI - March 24, 2017 - Dirt Kings Tour officials are excited to announce Hoosier Racing Tires will be the official racing tire of Dirt Kings Tour through 2020. Hoosier Racing Tires and Hoosier Tire North provide premium racing tires to racers on Dirt, Asphalt and the Drag Strip. Specific to the Dirt Kings Tour; Hoosier's W30S, M30S and WRS (I and II) D55 tires have been a dependable choice for Midwest racers for many years and will carry cars in the Dirt Kings Tour into the future. Hoosier Tire North's support of the Dirt Kings Tour will provide prize money to be paid out in the Championship Point Fund. The Dirt Kings Late Model Tour is a professional racing series based in Wisconsin. In its inaugural season the series will reach fans in most of the major markets in Wisconsin. The Tour will bring high energy entertainment that will captivate fans and build recognition for the series and its sponsors. In 2017, the Tour will sanction 12 events at 9 venues. More information about the Dirt Kings Tour is available at www.dirtkingstour.com. Get more info about Hoosier Tire North at www.hoosiertirenorth.com and info about all of Hoosier Racing Tires at www.hoosiertire.com. Freedom, WI - March 23, 2017 - The Dirt Kings Tour is excited to announce that Wilwood Disc Brakes will present a $50 product certificate to the Lucky 13th finishers in each 2017 feature event! Additionally, Wilwood Disc Brakes will be providing contingency prizes to be awarded at the 2017 season ending banquet. Wilwood Disc Brakes manufactures brake components for a very wide array of applications. Wilwood has been an industry leader in auto racing for decades providing ultra-dependable brake rotors, calipers and master cylinders. Freedom, WI - February 28, 2017 - Dirt Kings Tour Promoters are happy to announce that Five Star Race Car Bodies will give away two MD3 Combo Kits this season. Two drivers, who have completed 80% of the Dirt Kings Tour races, will be randomly selected at the end of the year to receive a MD3 Combo Kit. Five Star Race Car Bodies of Twin Lakes, Wisconsin is an industry leading race car body parts manufacturer. Five Star’s 40 year old legacy includes production of parts used widely today in dirt, asphalt, off-road and drag racing. Five Star has long been heralded as an innovating leader in race car body technology by producing affordable and durable race car bodies. Five Star’s state of the art production facility allows them to continually deliver fresh and innovative designs to today’s racer. Five Star’s offering for dirt late models range from MD3 Hoods, roofs and noses to wheel flares, rocker panels and aero valances. Freedom, WI - May 23, 2017 - On Sunday, September 3, the stars of the DiscountShopTowels.com Dirt Kings Late Model Tour will roll into the newly purchased 1/3 mile, high banked clay oval TNT Speedway in Three Lakes, Wisconsin. In addition to the winner receiving $2500, the race will also pay $400 to start. Toby Rott is the new owner of TNT Speedway and he has been working to revive the track to its previous condition, after sitting dormant in 2016. Rott is a familiar name in Wisconsin racing circles, spending most of his time as an asphalt late model racer. "I hated to see this facility sitting empty and I wanted to help bring racing back to Three Lakes and encourage racing on a local level," Rott says. "Once I purchased the track, I knew that having a Dirt Kings Tour race would be one of my first priorities." In addition to the DiscountShopTowels.com Dirt Kings Late Model Tour, Rott plans to host other specials this year at TNT Speedway. The DiscountShopTowels.com Dirt Kings Late Model Tour is a professional racing series based in Wisconsin. In its inaugural season the series will reach fans in most of the major markets in Wisconsin. The Tour will bring high energy entertainment that will captivate fans and build recognition for the series and its sponsors. In 2017, the Tour will sanction 12 events at 9 venues. To learn more about DiscountShopTowels.com Dirt Kings Tour, be sure to follow the DiscountShopTowels.com Dirt Kings Tour on Facebook (/dirtkingstour), on Twitter (@DirtKingsTour) and on Instagram (DirtKingsTour). PRO POWER RACING TO SUPPORT DIRT KINGS TOUR IN 2017! Freedom, WI - May 19, 2017 - Promoters of the DiscountShopTowels.com Dirt Kings Tour are excited to announce Pro Power Racing will support the series points fund for the 2017 season! Pro Power Racing, based in Sullivan, Wisconsin, provides engines that are at the forefront of engine design for a wide array of motorsports divisions across the world. From Dirt Late Models to Off-Road Trucks to Dirt Open Wheel Modifieds to Asphalt Late Models, Pro Power Racing is the leader in producing championship winning race engines. From the high-banks of the Eldora Speedway in Rossburg, Ohio, to the grueling challenges of Baja to short tracks in your own backyard, Pro Power Racing has an engine to meet all of your racing needs! Freedom, WI - February 27, 2017 - Dirt Kings Tour Promotors are happy to announce Amsoil and Freedom Synthetics will award an Amsoil product set to a competitor at each event. The product set will include Dominator Racing Grease, Severe Gear Lube, Synthetic Power Steering Fluid, High Performance Brake Fluid, Metal Protector and a 6-month Preferred Customer Membership (a $75 total retail value). To determine the winner of the Amsoil products, the winner of the fast dash will role two dice in victory lane after the dash. The combined total of the rolled dice will designate the finishing spot of the driver in the feature who’ll be awarded the Amsoil products. Amsoil specializes in developing synthetic lubricants that offer innovative answers to the greatest challenges vehicles and equipment present. The extraordinary performance of Amsoil synthetic lubricants in a range of markets – automotive, powersports, industrial, racing and more has made Amsoil’s influence in the industry unmistakable and our brand highly respected. Amsoil’s commitment to innovation has resulted in legions of brand-loyal customers. Amsoil’s line of racing specific products includes Dominator racing oils, Severe Gear rear end lubricants and a host of other high performance products can all be order from Amsoil independent dealer Freedom Synthetics online at http://freedomsynthetics.us or by calling 920-450-6091. Freedom, WI - February 24, 2017 - Promoters of the Dirt Kings Tour are excited to announce that Miller Electric Welders will present a Millermatic® 190 to the Dirt Kings Tour Mechanic of the Year! The Dirt Kings Tour Mechanic of the Year will be voted on by the crew chiefs of teams who compete in 80% of the Dirt Kings Tour events. The Mechanic of the Year also will have competed in 80% of all Dirt Kings Tour events. Additionally, Miller will present a Millermatic® 125 to the fast qualifier at the July 31, 2017 event at Plymouth Dirt Track. For decades, Miller Welders have set the standards of quality for welding machines and welding equipment. Miller Welders are widely used throughout motorsports as well as by teams competing in the Dirt KingsTour. The Dirt Kings Late Model Tour is a professional racing series based in Wisconsin. In its inaugural season the series will reach fans in most of the major markets in Wisconsin. The Tour will bring high energy entertainment that will captivate fans and build recognition for the series and its sponsors. In 2017, the Tour will sanction 12 events at 9 venues. For 2017, the Dirt Kings Tour will utilize a “Best 80%” points structure. The points drivers earn in their "Best 80%" of the total number of events will count towards their total points for the 2017 championship standings. As a bonus, drivers can earn 5 bonus points for each race beyond 80% of the total races. As an example, if a driver were to win 10 of 12 races the 10 wins would be counted as the accumulated points for the championship standings and the driver would earn 10 bonus points for the 11th and 12th race. 2017 Memberships are on sale now! Membership is required for participation in Dirt Kings Tour events. Dirt Kings Tour is excited to announce Fan Fueled Racing will be providing a $100 bonus for the winner of the fast dash at all of our 2017 events! July 31st the Dirt Kings Tour will roll into Plymouth Dirt Track Racing in Plymouth WI for a special event! Featuring an Outlaw style event format and special rules for this race, the 50 lap feature will have a BIG purse!! More details to come in the following weeks. Freedom, WI - December 19, 2016 - Dirt Kings Late Model Tour is excited announce their formation as a premier dirt late model series. The Dirt Kings Tour will operate as a traveling dirt late model series in Wisconsin offering competitors an accommodating rules package and fair competition. The Dirt Kings Late Model Tour is poised for a very successful inaugural season with nine races already scheduled. 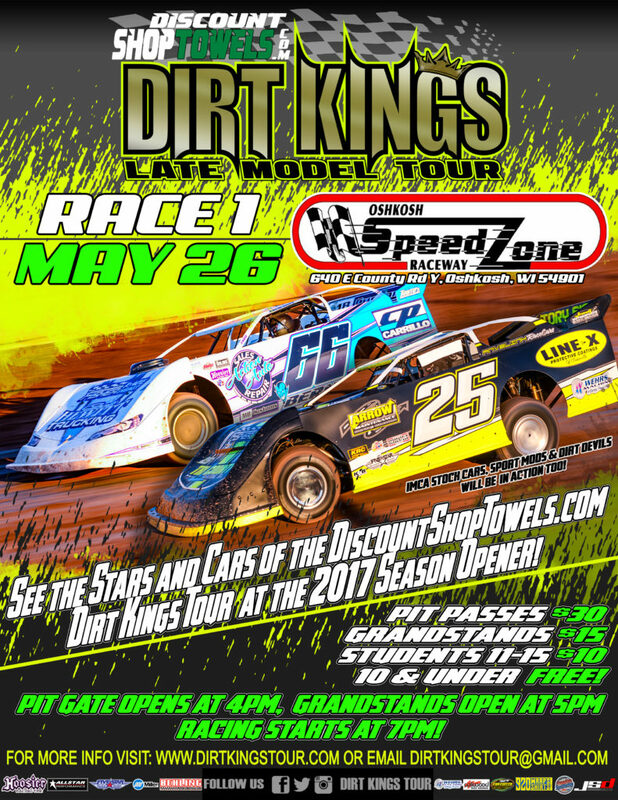 The 2017 Dirt Kings Tour will kick off Friday, May 26 at the 1/3rd mile Oshkosh Speedzone in Oshkosh, WI. On June 11, the Tour will visit Angell Park in Sun Prairie, WI, this will be the first ever Late Model race at the track. The Tour will headline the first night of the Clash at the Creek at 141 Speedway in Francis Creek, WI, on Tuesday, June 20. On July 2, the Tour returns to Angell Park in Sun Prairie, WI, for the second race of the season and on July 7, the Tour will join the IRA Sprint Car Series and the MSA Sprint Car Series at the Dodge County Fair Grounds in Beaver Dam, WI. As the summer winds down the tour heats up as the Tour will stop at Luxemburg Speedway in Luxemburg, WI, on Friday, August 11. Classic on September 23 and the Tour stops back at 141 Speedway as the featured event of the first night of their Fall Invitational on September 28. Each event will pay at least $1200 to the winner. Series Promoter, Jason Shultz is currently working with track promoters and sponsor partners to make the inaugural season a success. Shultz says, “The Dirt Kings Late Model Tour is eager to carry on a tradition of action packed racing established over 10 years ago by Bill Behling and the Wisconsin Dirt Late Model Association (WDLMA).” The Dirt Kings Late Model Tour reached an agreement with the WDLMA Board of Directors to dissolve WDLMA and Lucky 7 Series at the conclusion of 2016. The transition will allow the Dirt Kings Tour to grow and thrive for years to come. Dirt Kings Tour events will be run exclusively on Hoosier Racing Tires and feature cars with body components from Five Star Race Car Bodies. To learn more about Dirt Kings Late Model Tour, be sure to follow the Dirt Kings Late Model Tour on Facebook (/dirtkingstour), on Twitter (@DirtKingsTour)and on Instagram (DirtKingsTour). Keep up to date with Dirt Kings Tour headlines, pictures and events on Facebook. We'll tweet important announcements as event details! add username: dirtkingstour on snapchat for race day snap and fun images as we prepare for the 2017 season!